I'm not often at a loss for words. Granted, sometimes the only words I can muster are "Awesome!" and "Supercool!" However, these are still technically words. But, guys, the new Nathan Fillion approved commemorative Firefly ten year anniversary poster being sold at Comic-Con this July has left me speechless. After staring at this for a full five minutes, all I could think of was, "Why Captain Tightpants, what a big holster you have." 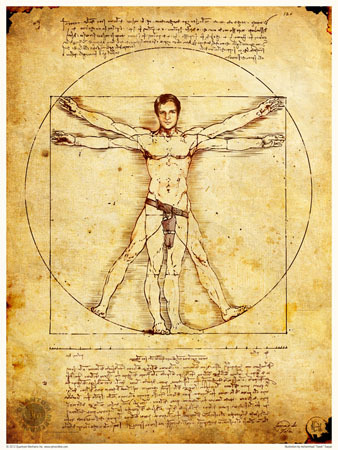 The print was created by Quantum Mechanix's Mohammad Haque based on Leonardo da Vinci's famous sketch depicting the perfect proportions of a human male, the Vitruvian Man. (Well, I guess that answers that question. It is possible to improve on perfection.) It'll be on sale on the company's site after Comic-Con for $14.95. A t-shirt version will also be available for $19.95. And since we're on the topic of naked Nathan Fillion, I'll just leave this behind-the-scenes photo from Joss Whedon's space cowboy project here for your amusement. That's the only word I've got. I wish I was going to Comcic-Con this year: thewhole Firefly cast gettng together.